Thumb and Wrist Pain – De Quervain’s Tenosynovitis - Solutions Northwest, Inc. Many workers perform repetitive tasks with their hands at work, which may put them at greater risk for thumb and wrist pain. 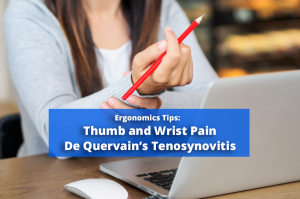 Furthermore, studies have revealed that women may be more susceptible than men to thumb and wrist pain in the workplace, specifically to De Quervain’s tenosynovitis. “De Quervain’s is more common in women than in men, and almost 50% of new mothers experience this condition. It has a tendency to develop during pregnancy, when fluid may be retained. It may also develop during menopause,” writes WestChesterMagazine. De Quervain’s may be caused by a variety of work related or personal factors. Common work related factors include repetitive motions with the hands, movement that involves wrist bending, gripping, awkward lifting movement, and twisting. Repetitive tasks at the office, at an assembly line warehouse, or any job that includes twisting screws, using a keyboard or mouse, rapid repetitive hand activities, and even the use of a smart phone may put workers at risk for De Quervain’s tenosynovitis. Symptoms include pain at the radial side (the thumb side) of the wrist, spasming, tenderness, burning sensation in the hand, swelling, and difficulty gripping. The pain often increases as you move your thumb and wrist. Why women more than men? One reason women are affected more often than men by De Quervain’s tenosynovitis may be due to the changes a woman’s body goes through during pregnancy. During pregnancy, women experience fluid retention, which may cause vulnerability to inflammation of the fluid-filled sheath that surrounds the tendon, especially if a repetitive job is involved. Outside of the workplace, new mothers experience wrist and thumb pain from lifting their baby or holding their baby’s head during feeding. Other contributing factors may include hormonal changes that happen during pregnancy and menopause. What should you do if you have thumb and wrist pain? Speak with your doctor – Always consult with your doctor when experiencing pain. A doctor can provide an x-ray to rule out any serious injuries, such as a fracture. Rest – Allowing plenty of rest time is the best way to treat thumb joint pain, though work obligations may make this difficult. A thumb splint or brace can assist in helping to rest and ease the workload of the hand. Reduce inflammation – Your doctor may prescribe anti-inflammatory drugs or creams that can help with recovery time, as well as provide injections as treatment. Hand therapy – A hand specialist may offer you special massage treatments, such as ultrasound massage. They may also provide stretches and strengthening exercises. Asses your workstation’s ergonomics – Contact an ergonomics consultant to ensure that your workstation is properly set up. An ergonomics specialist will evaluate your workstation with the objective to prevent injury or prevent further damage, as well as provide recommendations to optimize your workspace. As with any pain or work injury you may experience, be sure to consult your doctor to rule out any serious damage. Remember to remain proactive about your health and continue to seek out new ways to improve your health. As always, be sure to share these tips with your co-workers or employees and for more guidance on all work related health and safety issues, visit SolutionsNW.com or Contact Us for more detailed information. Don’t forget to subscribe to our blog for more ergonomics tips from Solutions Northwest Inc., ergonomics consultants located in Washington State, Northern California, Oregon, Seattle, Olympia, Tacoma, and Portland.